computing model appears to be very lucrative, since it adopts pay-as-you-go strategy, and gives a good Return-on-Investment(ROI). Nevertheless, cloud services providers can make good revenues, only when they service large volumes of customers. To be a successful, Cloud Service Provider, you must be able to keep the operational efficiency of your cloud high. Clouds are expected to have a high degree of Reliability, Availability and Serviceability – terms which are usually associated with IBM Mainframes. Every cloud on the Internet has a data-center. Out of total cost of running a cloud, most of the expenses are from the operational side. A whopping 44 percent (huge chunk) of the cost goes into maintaining man-power at the data-center. To achieve operational efficiency, the Cloud Computing Providers make use of automation and virtualization. Virtualization is the forte of IBM Mainframes. Ever since the inception of the Virtualization idea by IBM in 1979, most other computer firms have made huge benefits out of it. Building cloud services with a Mainframe will allow automation¸ to an extent that, data-centers will be able respond to huge variations in workload, in real-time, moment-to-moment without any manual intervention, thereby allowing a small team to manage and operate the equivalent of hundreds of Intel and RISC Servers. IBM Mainframes are comparatively inexpensive. If you have a distributed system, with many customers, and millions of users, imagine the cost of salary of the IT staff and administrators, and their benefits. Using Mainframes with just a few Mainframe Administrators, can cut down the costs drastically. Energy efficiency is another important advantage. This is one feature which IBM's high end Mainframe Servers (System z and Power Systems Servers) boast off. Indeed, IBM is moving its workload from 3,900 mid-range servers to just 30 Mainframes, and resulting in great energy savings(upto 80 percent) and saving of floor space. Though Cloud Computing is new, many of its ideas, have its roots in IBM Mainframes. The following similarity between Cloud Computing and Mainframes makes it clear.. IBM Mainframes have been running multi-tenancy(multiple users on a single machine on a single application) for decades and decades. Its basically a Mainframe model, where number of things run together on a single machine, but in isolation. You need Reliability, Availability, Security, Auditing, Privacy, Data Integrity. 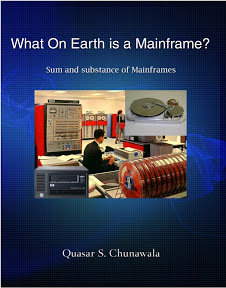 Indeed, the ultimate goal of Mainframes has been Shared Computing. It has been supporting Multi-tenancy ever since, the TSO(Time Sharing Option) was introduced in 1962. It remains to be seen if this is the next BIG THING, or just a fad.